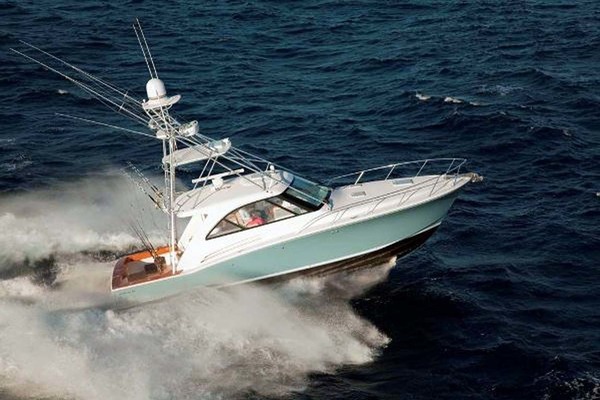 High performance, tournament winning fishing boat . Ready to take you to the fishing grounds. 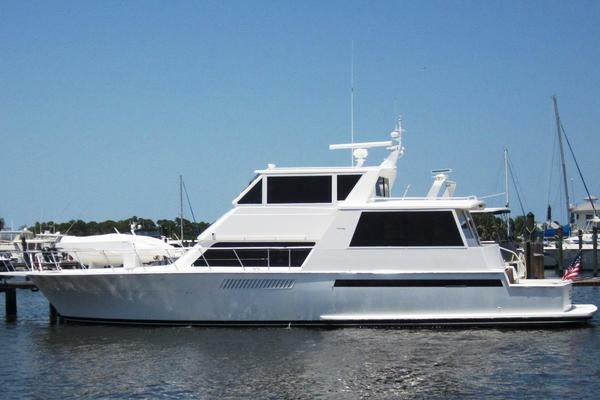 This is the boat that can get make all aboard content as it offers a comfortable cockpit, flybridge and interior. Starting from the stern. The cockpit deck is factory nonskid. There is a tuna door in the transom. Center in the cockpit is a fighting chair . The back bulkhead has a freezer, tackle center and engine room access. The cabin door is on the starboard side that enters the salon. In the salon on the starboard side is the breaker panel housed in a cabinet that also contains the entertainment system. Forward of that is the L shaped dinette. Overhead is a television with storage beside. On the port side of the salon aft is a large L shaped couch. Forward on the port side is the galley. The companionway is midship, port side. It leads down and forward to the state rooms, heads and showers. As you move down the stairs on the port side are the crews quarters which offers a double bunk bed. The hallway also contains a combo washer/dryer. On the starboard side is the full master stateroom which also has a private full head and shower. Forward of the master is a day head on the port side which connects to the VIP state room located all the way forward The VIP queen size bed is on the starboard side. Two steps up into the salon on the starboard side is the breaker panel . Forward of that is an entertainment center. It holds the JVC stereo and DVDs for the TV. All housed in Viking's teak cabinets with high gloss finish. Forward of entertainment center on the port side is a large sized dinette. It has an L shaped seat with a large teak table. There is storage under the seats. Upon cabin entry on the port side aft is a very large white L shaped couch with storage under the seats. The salon floor is covered with a off white rug. All of the cabinets in the entire salon are teak with Viking's high gloss finish. The galley front is a mirror finish as is the bulkhead behind the dinette. The stai way is on the mid port side which takes you to the staterooms. The galley is up and forward in the salon on the port side. It has a full sized refrigerator/freezer. There is a large sink under the portside window. A two burner stove is recessed into the Corian countertop. The large counter wraps around to the middle of the salon offering an ample food prepartion area. Galley has storage under the counter. . Microwave is bulit into the forward bulkhead. The galley floor is a teak and holly wood finish. The master stateroom is on the starboard side. There are drawers underneath the Queen sized bed and the top of the bed lifts for addtional storage. On the starboard side wall there are drawers. Forward on the starboard side is a hanging locker. On the forward bulkhead is an entertainment center. Below that is a vanity. All the way forward in the master cabin is a private full master head with shower. All of the wood is teak with a high gloss finish. The floors in the stateroom are wall to wall carpet. Head has teak and Holly flooring. There are mirrors over the head board as well as and over the vanity and in the head. The master stateroom has its own AC/Heat. All the way forward is the VIP guest stateroom. The beds are on the starboard side and are both above average in size. There is a hanging closet on the port side as well as an entertainment center. This makes it easy to watch TV from either bed. The day head also connects to this guest stateroom. It has a full size head and shower. There is a crew quarters on the port side. It is a bunk room with a hanging closet. The boat is in very good shape. Call for more details.